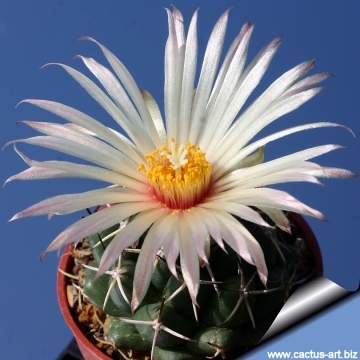 Origin and Habitat: It comes from the Mexican state of San Luis Potosí. 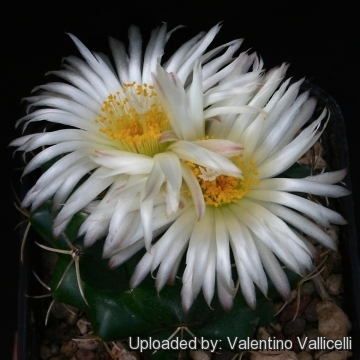 It is found in the Río Verde, Villa Juárez and Cd. del Maíz Municipalities. This species is known only from five locations (extent of occurrence 4,000 km²). 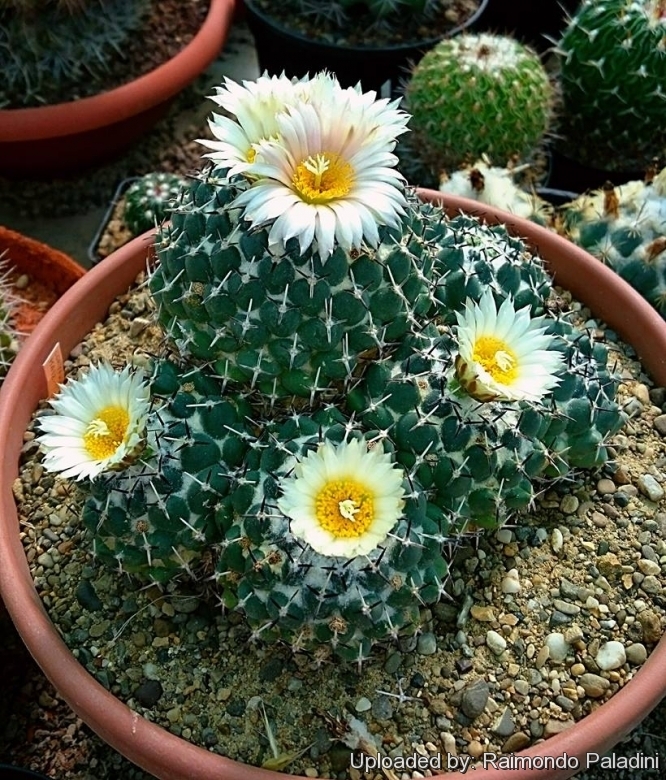 Habitat: Coryphantha maiz-tablasensis is a group-forming plant which grow well hidden in mud flats with a very few accompanying trees or shrubs. The main site is in the dry lagoon of Las Tablas in gypsum soil with grass. The soil is sandy gypsum (up to 98% gypsum content), usually dry. The type-locality near Las Tablas in the Mexican State of San Luis Potosí is more and more endangered by intensified farming and large portions of the range have already been lost, the same is true for the few other locations known, and only a few plants are left, which are likely to be removed by collectors. 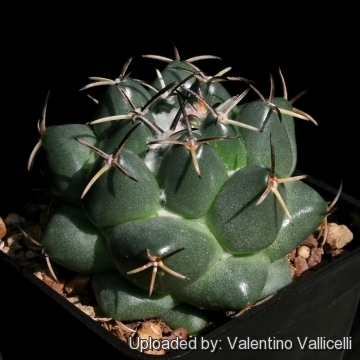 This species grows together with Turbinicarpus lophophoroides, while in the immediate vicinity, where the concentration of salts is lower, it’s possible to find Lophophora viridescens, Ariocarpus kotskoubeyanus and Ancistrocactus uncinatus. 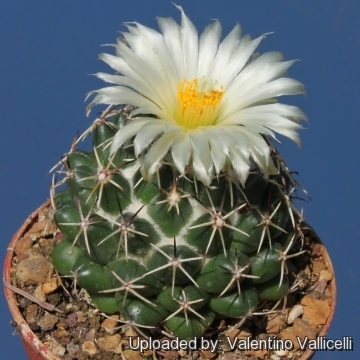 Description: Coryphantha maiz-tablasensis is a slowly depressed-globular cactus, often clumping and group-forming, with distinct beety root and probably is the easiest Coryphantha to be recognized for its 4-5 radial short radial spines. 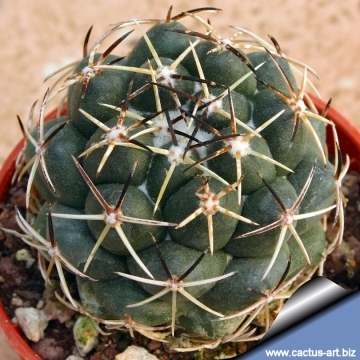 Stems: Depressed spherical up to 9 cm broad and high, they are offsetting and forming clumps. Radial spines: 4-5(-9) white with dark tip, 5-8(-12)mm long. 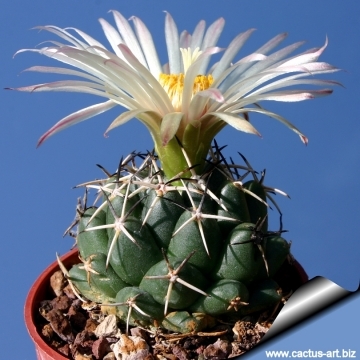 Flowers: It blooms easily, the crème-white flowers are 4-6 cm in diameter. 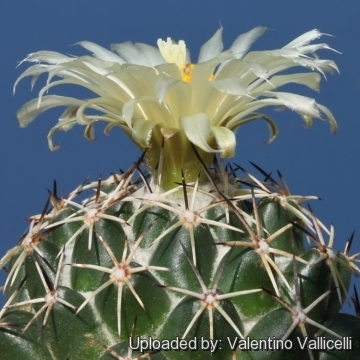 4) Bravo, H. and Sánchez-Mejorada, H. “Las Cactáceas de México” Vol. 2. Universidad Nacional Autónoma de México, D.F. 1991. 5) Rzedowski, J. “Vegetación de México.” Limusa, Mexico. 397 pp. 1978. 6) Smith, M., Sotomayor, M., Dicht, R.F. & Lüthy, A.D. 2013. 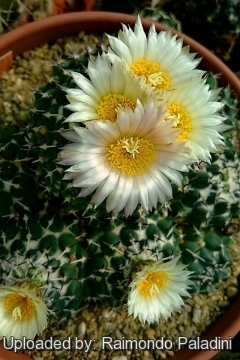 Coryphantha maiz-tablasensis. The IUCN Red List of Threatened Species 2013: e.T40819A2934106. http://dx.doi.org/10.2305/IUCN.UK.2013-1.RLTS.T40819A2934106.en. Downloaded on 09 October 2016.